The latest version of Google Drive for Android added a lot of new features: a new interface based on Material Design, a better search feature that shows results as you type, custom message for sharing files. 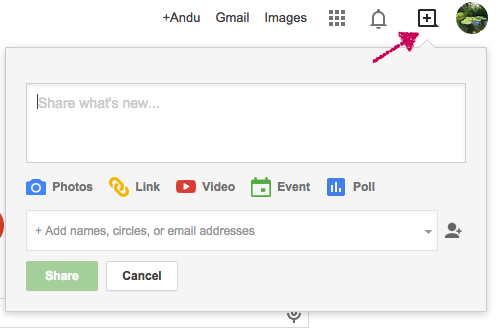 "You can also turn on link sharing to make the file public and set access to view, comment, or edit. This automatically copies the link to the clipboard and allows you to paste it wherever you want." 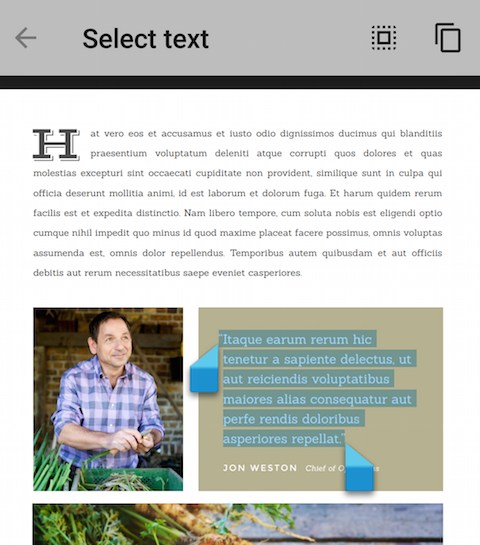 Google Drive for Android now also includes a PDF reader. 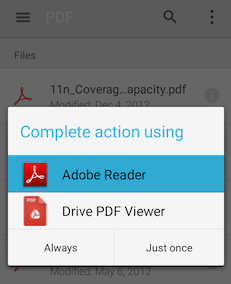 The application still uses the default PDF reader installed on your device, but you can now select Drive PDF Viewer. It works offline and it can be used from any other Android application, not just from Google Drive. Google's PDF viewer is pretty basic: it has a search feature, it lets you select and copy text, upload files to Google Drive, print files and share them. Updates are gradually rolled out, so you may not be able to install the latest version of the Google Drive app from Google Play. Android Police has a link to the APK file. 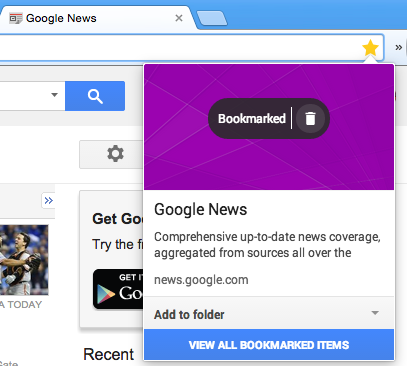 Google has been working on a new bookmarking manager for Chrome. For now, it's available as an extension in the Chrome Web Store that replaces the regular bookmark manager, but it will probably become a standard Chrome feature. The updated bookmark manager includes a new interface, search powered by Google, sharing and automatically generated folders. 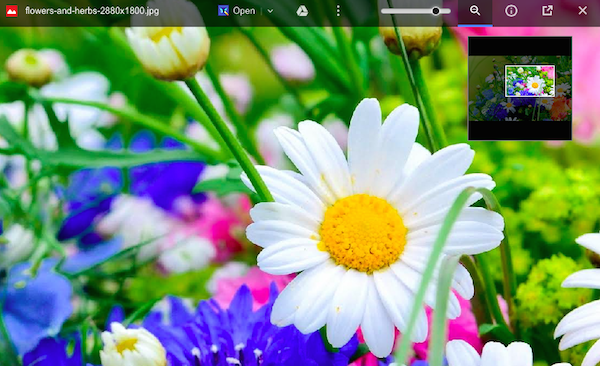 "When you bookmark, you can now save an image and note to make your bookmarks more helpful. 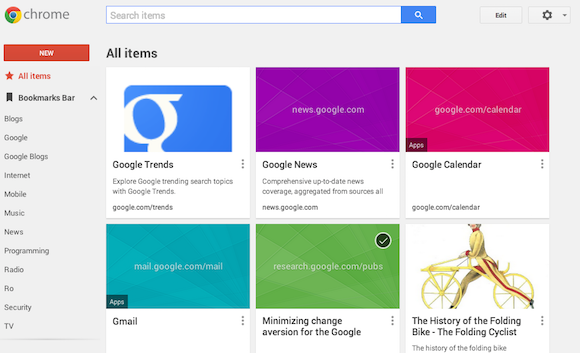 Also, Google will suggest a folder if it seems like it could be a fit," informs Google. Some of the existing bookmarks are updated with images and descriptions. The card-based interface lets you remove images, edit titles, descriptions and URLs, select bookmarks just like in Google+ Photos, move them to a folder or delete them. The new bookmark manager uses Google to search the full content of your bookmarks, but this doesn't work if your bookmarks are encrypted. Other features that didn't work for me: sharing folders and topics, which should automatically group your bookmarks into categories like "Tokyo" and "Photography". 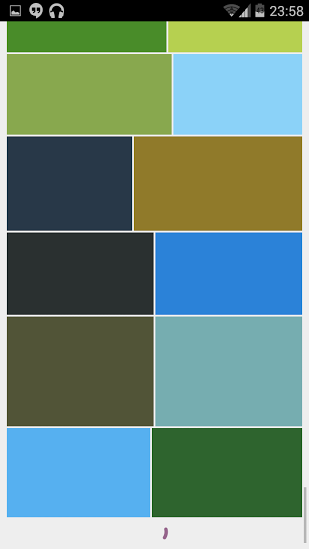 Opera Mini had a cool feature: when disabling images, the browser still displayed some placeholders with the dominant colors of the images. 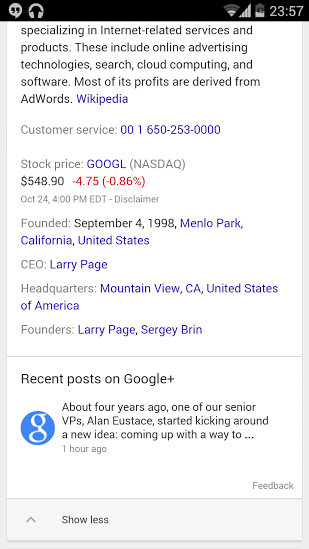 Google tests a similar feature for mobile image search: while waiting for the search results to load, placeholders are no longer gray, they use colors from the images. 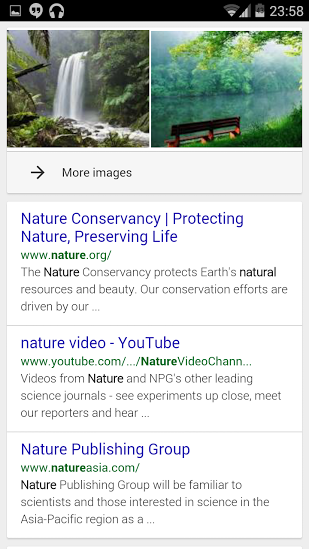 Google also tests a Material Design mobile search interface with fluid animations and smoother interactions. 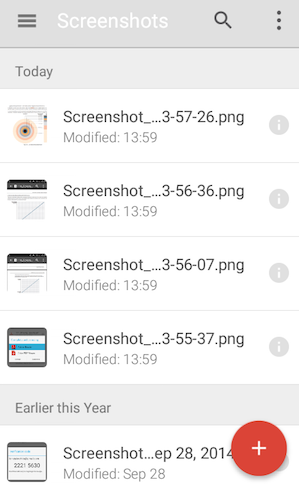 Update: Android Police has more screenshots from a Mechanical Turk account. I'm not sure if this is new, but I thought it's worth mentioning. 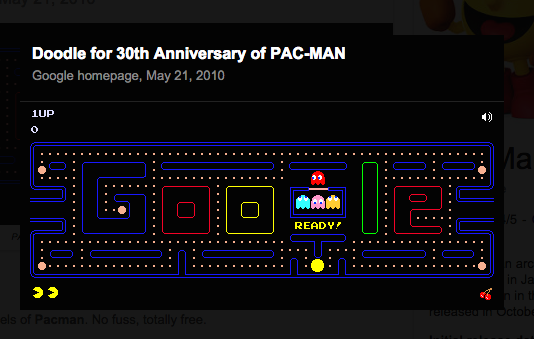 When searching for [pac man], Google shows a card that links to the doodle from 2010 that celebrated 30 years of Pac-Man. Google doesn't have a card for doodles, so this was manually added. 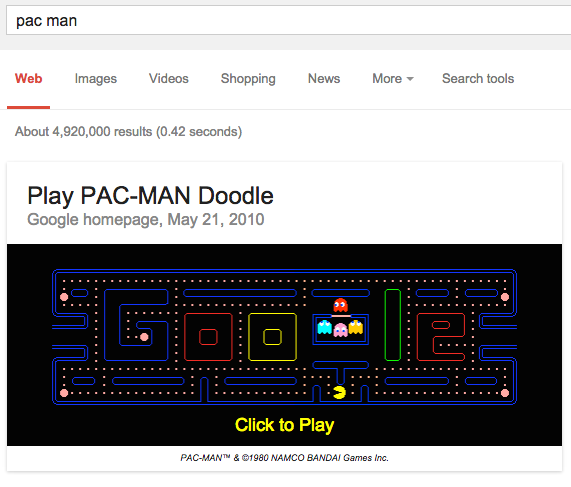 The card has two calls-to-action: "Play PAC-MAN Doodle" and "Click to Play", it includes the source of the doodle: "Google homepage, May 21, 2010", a large promotional image and some copyright information: "PAC-MAN™ & ©1980 NAMCO BANDAI Games Inc."
The game plays inline and there's a permalink for the game. 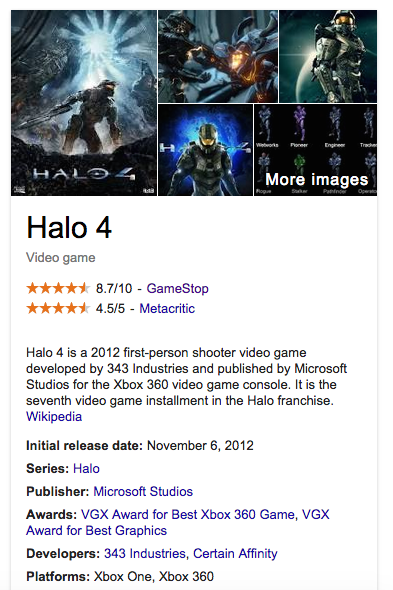 Google's Knowledge Graph cards now include information about video games. You can find all about Pac-Man, Angry Birds, Fruit Ninja, Candy Crush Saga, Grand Theft Auto, Need for Speed, Minecraft, Halo, Counter-Strike or any other game for mobile devices, desktop computers or consoles. 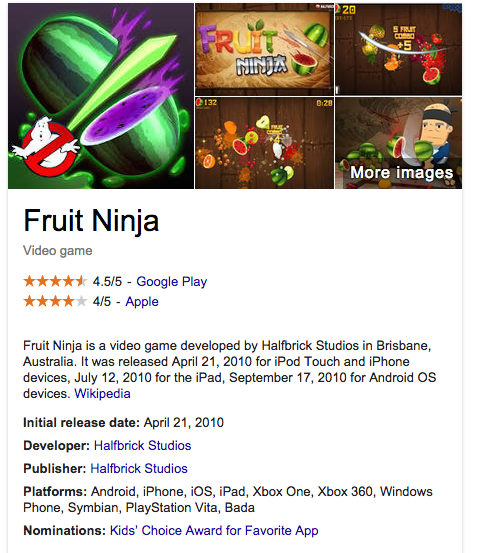 Google shows links to app stores and gaming sites. Cards also include ratings, screenshots, initial release date, developer information, supported platforms, publishers, awards and more. Reinventing email is not an easy task, especially when you have a successful service like Gmail. 10 years after creating Gmail, Google is back at work to bring "an inbox that works for you". The new service is called Inbox by Gmail and it's not just a new interface for Gmail, it's a productivity service that helps you get things done. "We get more email now than ever, important information is buried inside messages, and our most important tasks can slip through the cracks — especially when we're working on our phones. For many of us, dealing with email has become a daily chore that distracts from what we really need to do — rather than helping us get those things done," says Sundar Pichai. Inbox syncs with your Gmail account and uses all your labels and filters, but adds some new labels that automatically categorize mail: travel, finance, purchases. Google groups messages from the same category into bundles, so you can quickly review them. There are some new concepts: pinning messages, marking them as done, sweeping messages, highlights, assists, snoozing messages. * Pin emails you need to get back to: Google moves them to your inbox and they'll stay there even when you mark all the emails as done. * When you're done with an email, mark it done to move it out of your inbox. * Sweep marks all unpinned emails in a section as done. * Snooze emails to remove them from the inbox until later: you can pick a time when they'll be added back to the inbox or you can snooze emails until you you arrive at a place (for example: home). * Highlights show important content from emails directly in your inbox: images, documents, events, flight information. * Assists add relevant information like phone numbers, maps, check-in links, package tracking links. In many ways, pinning replaces starring, mark as done replaces archiving, but they're something new. They're the building blocks of a smarter inbox. 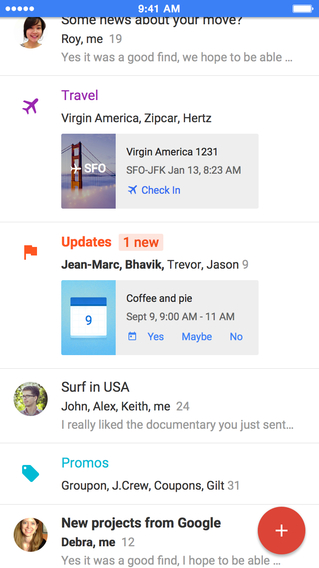 You can create reminders and Google adds them to your inbox and sync them with Google Now. 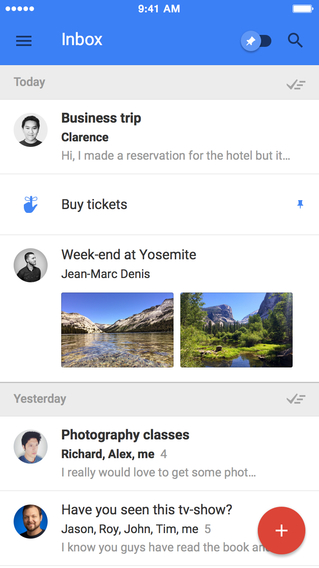 Inbox by Gmail is a work in progress. There's a desktop web app for Chrome and there are mobile apps for Android and iOS/iPhone. 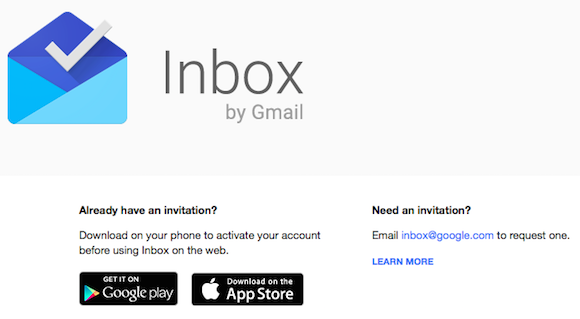 You need an invitation to use Inbox, but you can get one by sending an email to inbox@google.com. "Starting today, we're sending out the first round of invitations to give Inbox a try, and each new user will be able to invite their friends," informs Google. Inbox doesn't replace Gmail yet, it's more like a new take on email for power users. Mobile optimized, context aware and task oriented. 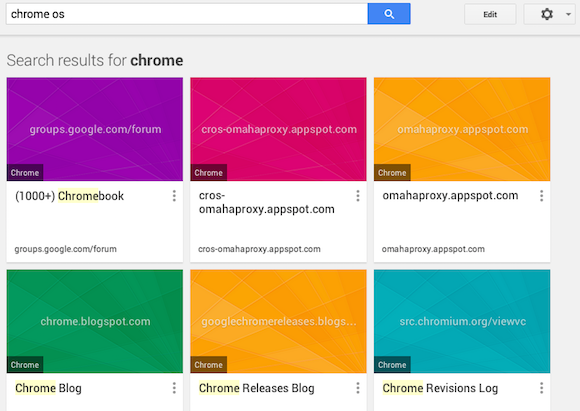 Surprisingly, not yet available for Google Apps. 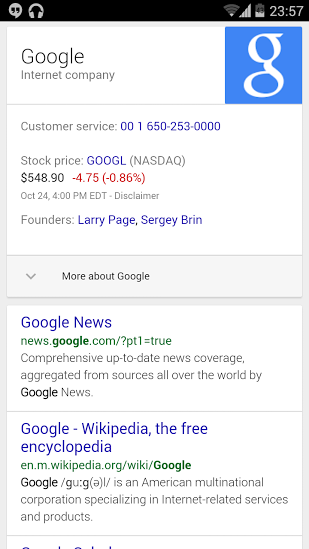 The share button from Google's navigation bar looks different: it now uses an icon instead of text and it's more compact. 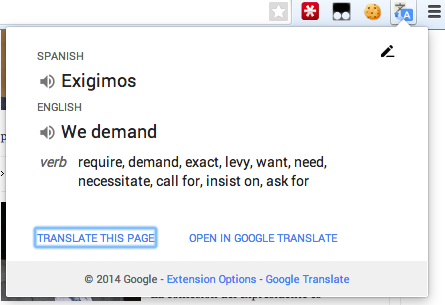 It's interesting to notice that Google used a text label only in the English interface. It's easy to switch between iOS and Android, especially if you use Google's services. Google published a guide that helps you switch from iOS to Android, while also highlighting the advantages of Google's services. You can upload the photos from an iPhone or iPad to Google+ Photos by downloading the Google+ app and enabling the Auto Backup feature. You can also upload the songs from the iTunes library to Google Play Music for free, but you'll have to use a computer. Transferring contacts is more complicated if you don't use Gmail. You'll have to export contacts from iTunes or from the service you're using and upload them to Gmail. Transferring apps is the most time consuming step. "Google Play has over 1.3 million apps to choose from so you can find all your favorites and discover new ones. For apps where you're a subscriber, like Netflix, you can simply transfer your service over to Android for free. Just download the same app from Google Play and sign in to your app." 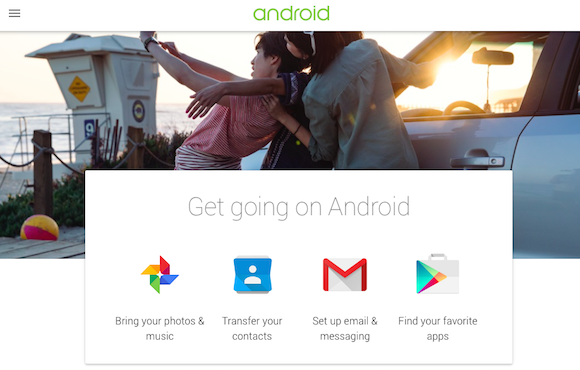 Google's guide doesn't help you migrate SMS messages, call history, calendars and notes. If you use iCloud for calendars, you can export them using this trick and then import them to Google Calendar. Exporting iCloud notes is a manual process: "Open the Notes app at iCloud.com. Copy the text of each note and paste it into a document on your computer, such as a Pages or TextEdit document. Save the document to your computer." 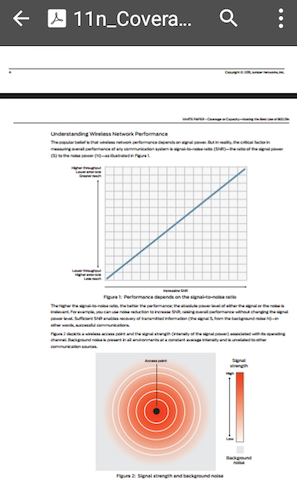 Apple has recently published a similar guide for switching from an Android device to an iOS device. Apple links to various apps that automate the process. Unlike Apple, Google makes it easy to export your data. You can export your mail, calendars, documents, notes, photos, videos, messages with only a few clicks. If you use Google apps like Chrome, Google Maps, Google+, Google Play Music, Hangouts, Google Drive, Google Search, Gmail, Google Keep for both Android and iOS, you can quickly switch between Android and iOS devices. 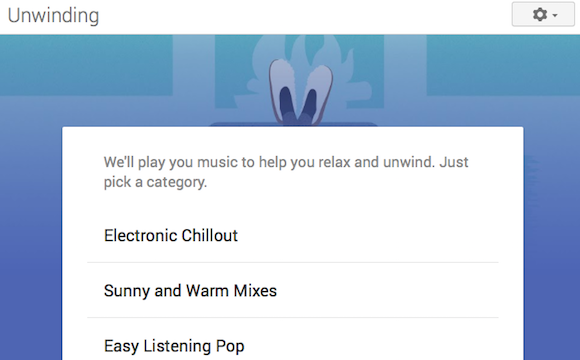 Google bought Songza and now it brings its features to Play Music, but only for All Access subscribers. The Listen Now section recommends radios based on moon, time of the day or activity. You can play music for working out, unwinding, having friends over, spending time with your family and more. "Each station has been handcrafted—song by song—by our team of music experts (dozens of DJs, musicians, music critics and ethnomusicologists) to give you the exact right song for the moment," informs Google. 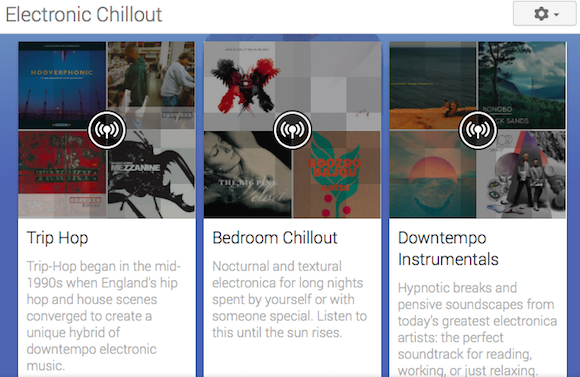 I picked Unwinding and then Electronic Chillout and Bedroom Chillout. 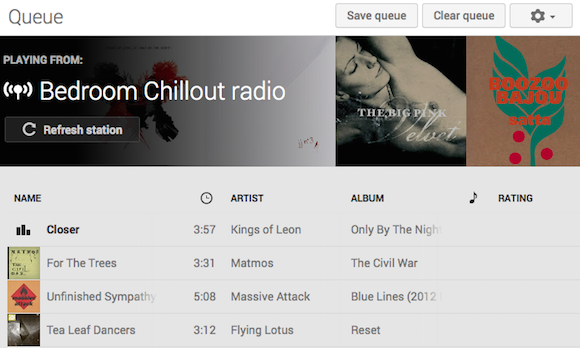 Google creates a regular radio station and you can remove songs, reorder them, create playlist or listen offline. "As part of this update, we’ve also redesigned the 'Listen Now' page so you can more easily discover new music. Now you’ll see cards for all of your recently played music, new releases you might be interested in, and radio stations based on what you like to listen to. You'll also notice that the new app uses Google’s material design, with bigger images, bolder colors and slick transitions," explains Google. Songza-powered radio stations are only available in the US and Canada, probably because Songza is restricted to these countries. 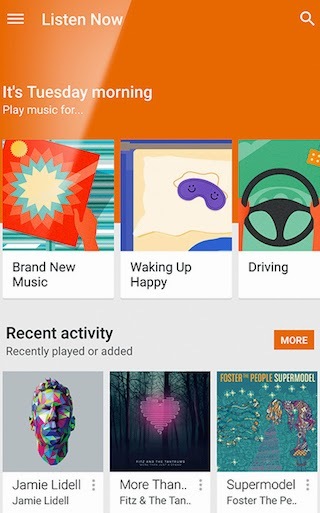 You can find the new radio stations in Google Play Music's web interface and the mobile apps for Android and iOS. 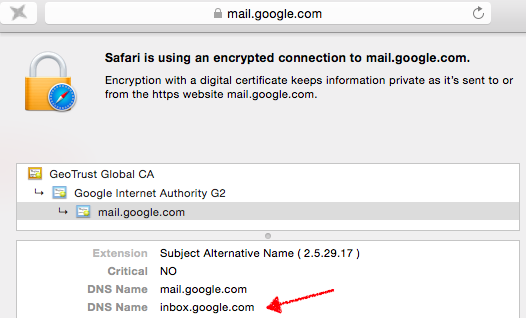 Ryan Goldstein, a reader of this blog, noticed a new addition to Gmail's SSL certificate: a reference to inbox.google.com in the Subject Alternative Name field. Subject Alternative Names allows you to secure multiple host names with a single SSL certificate. When visiting inbox.google.com, Google redirects to https://inbox.google.com/?pli=1 and returns a 403 Forbidden error message. This suggests that the site exists, but it's not yet publicly available. It's not clear if inbox.google.com will be a used for a new Gmail interface, a different service that uses Gmail data, a mail client or something else. Update: There's a Chromium bug report about "Inbox (BigTop) desktop freezing in Chrome Canary". Email message expands to show full text of most recent email in the thread, as well as number of other emails in the thread. No activity. Inbox application appears frozen. Cursor remains small hand with pointed finger. Update 2: Mihai Parparita spotted other references to BigTop in Chrome's bug tracker: "I clicked on it from my corp Bigtop account. I was signed in to Mirror with my personal account as the sync account." There are also many reference to inbox_app. Update 3: Android Police reports that the Gmail app for Android will handle email accounts from Outlook, Yahoo Mail and other email providers. You can already use Gmail's mail fetcher, but the new feature will work better and Google will be able to replace the Android Mail app with Gmail. Maybe this has something to do with Google Inbox? Update 4: The service is now available. If you've added photos to Google Maps Views and you'd like to remove them, Google offers a few options: removing photos from Google Maps Views and Google Maps or deleting photos from all Google products, including Google+. Photos are stored in Google+, not in Google Maps. 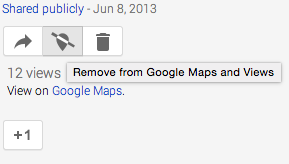 Open the photo page in Google Maps Views, click "Remove from Google Maps and Views" and you'll see this confirmation dialog: "Your image will remain in Google+, but will be removed from Google Maps products. This may take up to 24 hours." 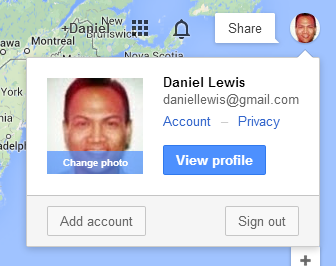 If you click the "delete" button instead, your photo is deleted from Google+ and all the Google services that use it. "When uploading your photos to Google Maps Views, your content will be publicly visible to other users. Geolocated photos that are shared on Google Maps may also be displayed in a variety of Google products and services, such as Google Maps for mobile, Google Earth, Google Search, Google+, Google+ Local, and third party sites using embeddable widgets or the Google Maps API," informs Google. There are other ways to remove photos from Google Maps Views: make the Google+ album private or uncheck the "Show location data" setting in the album properties. "Earth View displays a beautiful and unique Satellite image from Google Maps every time you open a new tab." 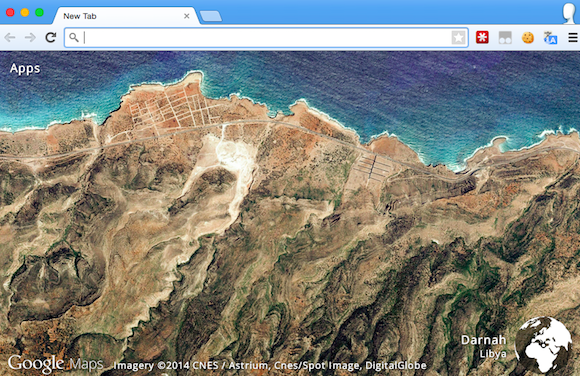 It's a Chrome extension that replaces the new tab page with a random Google Maps image. If you want to find more the satellite image, click the globe icon at the bottom of the page and you'll open the current view in Google Maps. To see a new image, open a new tab or refresh the page. While the Earth View images are fascinating, you'll probably miss some of the features from the standard new tab page: bookmarks bar, frequently visited pages, Google's doodles and navigation links. Earth View only shows a link to Chrome's apps page. 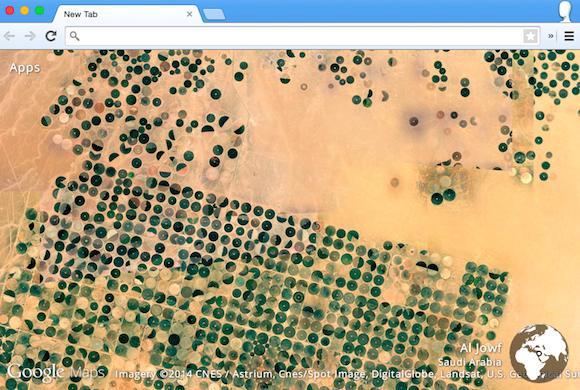 I've checked the extension's source code and there are almost 1000 satellite images. 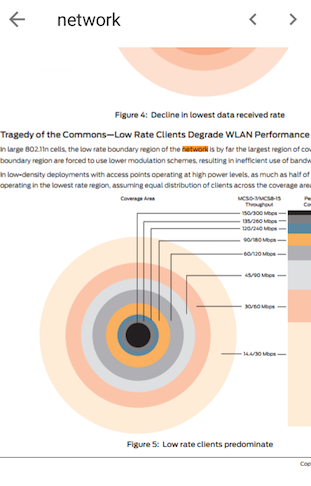 They're not bundled with the extension, they're loaded from JSON files like: https://www.gstatic.com/prettyearth/1003.json. 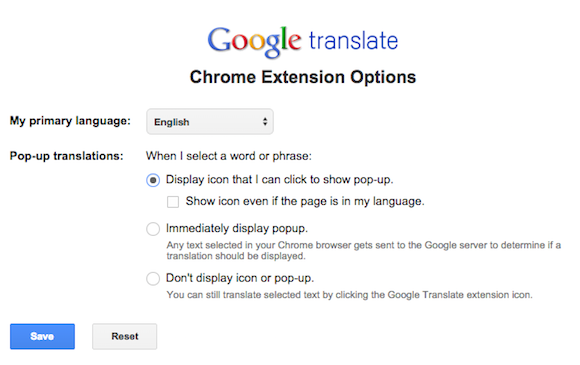 Chrome has a built-in translation feature, so why would you install an extension for Google Translate? 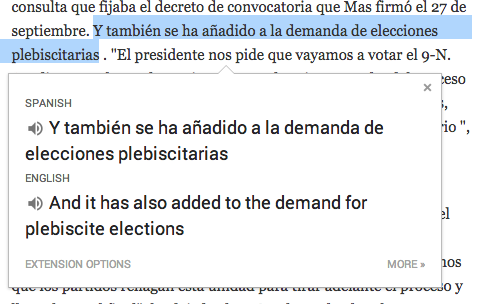 You can select text from a page, click the small Google Translate icon and get the translation almost instantly. You can also click the extension's button and type some text you want to translate or click "translate this page". The nice thing about the extension is that you can change your primary language in the extension's settings without changing your browser's interface language or your operating system's language. For example, Chrome for Mac "determines the browser interface language by the Language & Text setting in System Preferences." "The Translate team is working hard to connect people by breaking language barriers across computers, mobile devices and Internet browsers. Our users make more than 1 billion translations a day," informs the Google Translate blog. 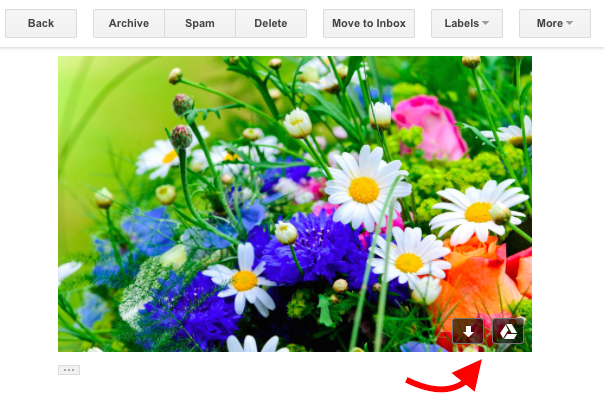 Gmail now treats embedded images just like image attachments. 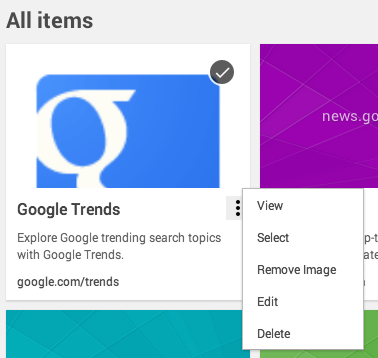 You can mouse over an image and click "Download" and "Save to Drive" or you can click the image to open it in the Google Drive viewer, which has additional features like printing, Google+ sharing, zooming, opening the file in a Google Drive app and more. It's also great for opening the image in full-screen mode. 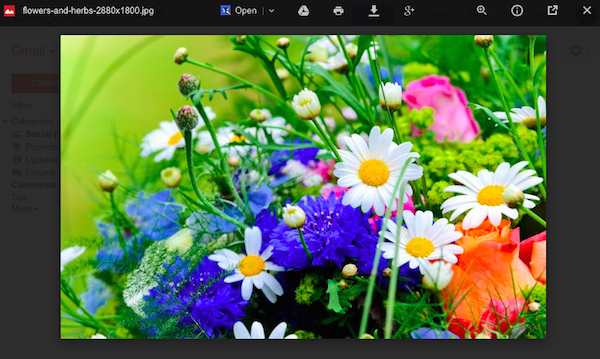 You can use the arrow buttons or press right/left arrow keys to open the next/previous image. "Similar to attachments, you can now click on large images within a message to see them full-screen in Gmail on the web," informs Google. It didn't work for a 384 x 103 image and a 266 x 210 image, while it worked for a 300 x 153 image. I assume that the minimum image size required is 300 x 150.